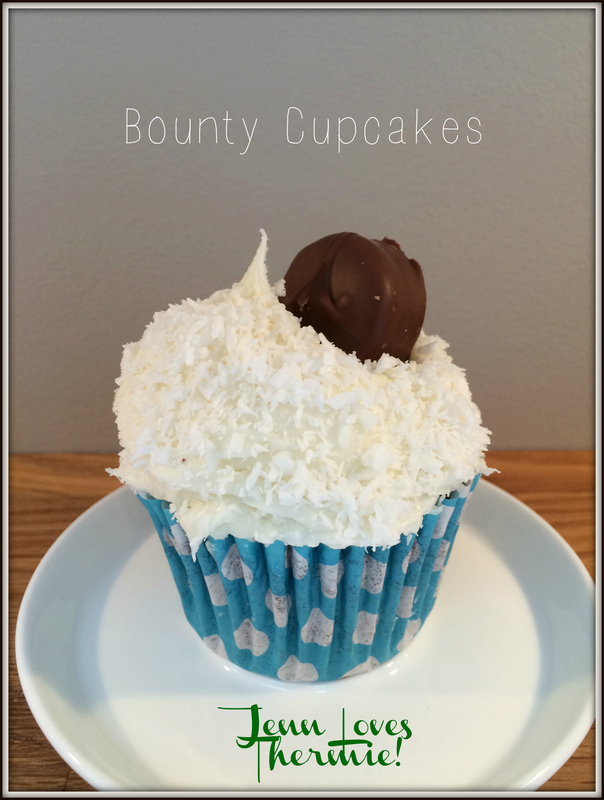 Chocolate & Coconut Cupcakes – Jenn Loves Thermie! Preheat the oven to 170 degrees and line the muffin tins with paper muffin cases to make the number you require. First make the cupcake mixture. Add butter, flour, sugar, cocoa powder, baking powder and salt to the TM bowl. Mix for 10 Secs/Speed 5. In a separate jug, mix together the milk and eggs by hand. Add the whisk to the TM bowl and add half the milk and egg mixture over 5 Secs/Speed 2. Add the remaining milk/egg mixture over 30 Secs/Speed 4. Spoon the batter into the prepared paper cases, filling them two-thirds full. Using an ice-cream scoop can make this process easier and will result in even cupcakes. Bake for 20-25 minutes or until the sponge bounces back when lightly touched. Leave to cool slightly before removing from the tin and placing on a wire rack to cool completely before frosting. While your cupcakes are baking, wash and completely dry to your TM bowl. Once your cupcakes have completely cooled, make the frosting. Weigh the icing sugar and then set aside. Gradually mix the icing sugar and butter together at Speed 3 until you have a crumbly consistency. Add the coconut milk at Speed 3 and then increase to Speed 6 for 20-30 Secs until the frosting is light and fluffy. Cut the coconut bars into pieces, one per cupcake. Once the cupcakes are cool, spoon generous amounts of the frosting onto each cupcake, then gently smooth over with a palette knife, make a swirl on top if you wish. Coat each cupcake in desiccated coconut and top with a piece of coconut chocolate.